David Yeskel, Systems Analyst for the City of Santa Monica, is a repeat Empower attendee who keeps coming back to build on his Laserfiche knowledge. What was your favorite thing about Empower 2014? In the five or six years I’ve been in attendance, Laserfiche’s annual conference has always been an impressive event. Even so, the overall experience somehow manages to notch up a few levels year-after-year. The Empower 2014 conference was no exception. The sessions ran with military-like precision, special events were well-planned and executed and the bright, young technical staff was ubiquitous and helpful. 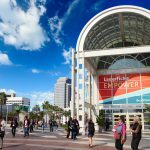 The warmth, camaraderie and sheer joy exhibited by both the staff and attendees was a giveaway that Laserfiche knows its niche—and serves it well. My favorite class was “Configuring the Laserfiche-SharePoint Integration.” It was very helpful to see the synergy in the two products, the simplicity of the integration and the associated user interface. This class really helped to de-mystify the concept of integration and see it put into practice. Despite the obvious appeal of the social events—especially the NRG-ize party, which was a lot of fun—I found that the best networking opportunities were the lunches. On a couple of days, I picked a table with Laserfiche employees who were eager to share their product knowledge with me. I got some great back-end configuration tips from a Laserfiche engineer that will help when my organization transitions to Laserfiche Rio. Resist the urge to over-schedule yourself. While a full slate of scheduled sessions might look good on paper—and to your boss—building in a little time to network with other users or exhibiting vendors can be of great value to you and your organization. Early bird registration for Empower 2015 is now open! Reserve your spot at the biggest Laserfiche event of the year by November 21, 2014 and save $300.